happy cinco de mayo! 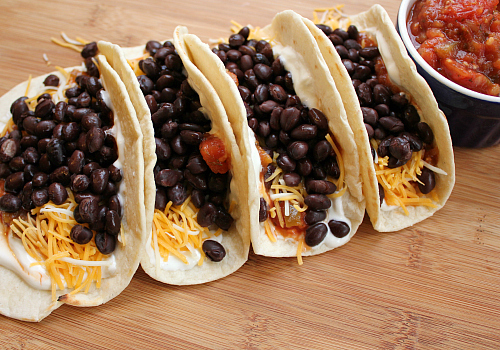 in honor of cinco de mayo today, i thought i'd share a recipe for quick and easy vegetarian tacos. the other day, we were pressed for time and we needed to quickly throw together something to eat for dinner. 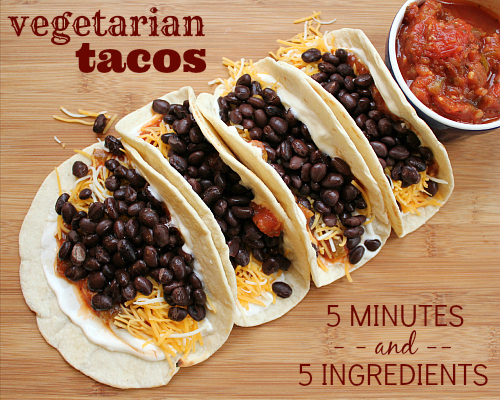 we grabbed a few ingredients that we had on hand and made vegetarian tacos in less than 5 minutes. even though there were only a few simple ingredients in them, we could not get over how good they were! 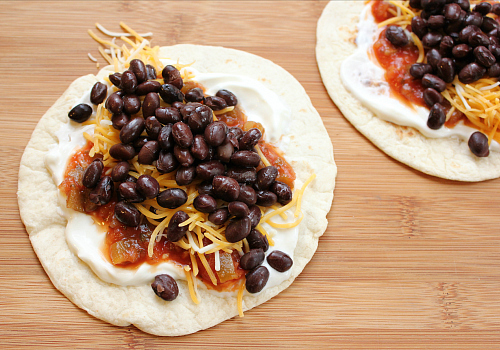 soft flour tortillas, sour cream, salsa, cheese, and black beans. super simple and super delicious! honestly, this can hardly be called a recipe. 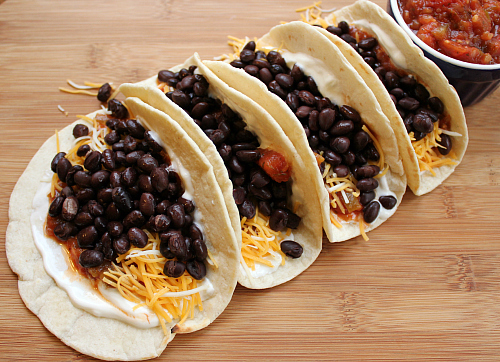 all you have to do is just throw a few things together and you have yummy tacos in less than 5 minutes. so convenient if you are on the run or need to whip up a quick dinner or snack. by the way did you notice that the date today is 5/5 and we are making tacos in 5 minutes with 5 ingredients? that's a lot of 5s. maybe someone should play 5 today on the lottery! speaking of tacos . . . make your own taco seasoning and crock pot chicken tacos. 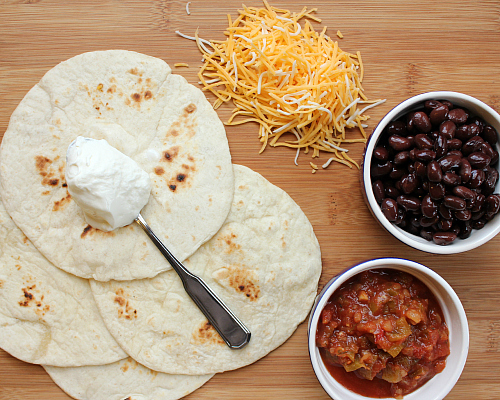 place the tortillas in a pan or on a griddle over medium-low heat. allow the tortillas to warm (about 1 minute for each side). lay the tortillas on a plate. spread approximately 1 teaspoon of sour cream and approximately 1 tablespoon of salsa evenly on each tortilla. arrange the shredded cheese in a line down the center of each tortilla. put the black beans in a bowl and microwave them for 1 minute. 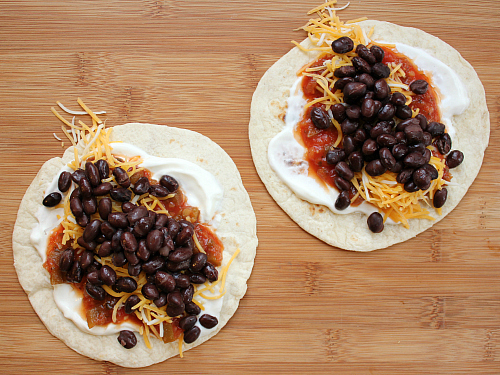 evenly distribute the beans between each tortilla, arranging them on top of the cheese. They look so perfect and delicious. Have not made any type of tacos in a long while.